The Tektronix 4051 was a graphics-capable desktop microcomputer produced by Tektronix in the late 1970s through the early 1980s. The display technology was similar to the Tektronix 4010 terminal, using a direct-view storage CRT display (like an analog storage scope) to avoid the need for video RAM. 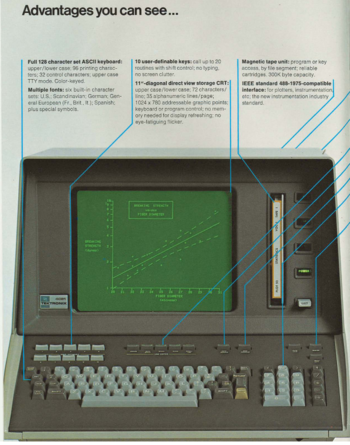 It was all-in-one design with the display, keyboard, CPU and a 300 kByte DC300 quarter-inch cartridge tape drive in a single desktop case, and included a GPIB interface. A simple operating system and BASIC interpreter were included in ROM. The storage tube display allowed the screen to retain images drawn to it, eliminating the need for frame-buffer memory. This allowed the resolution to be as high as the hardware could handle, which was ostensibly 1024 by 1024 but limited by the physical layout of the screen to 1024 by 780. It also allowed the machine to dedicate all of its memory to the programs running on it, as opposed to partitioning off a section for the buffer. The 4051 was based on an 8-bit Motorola 6800 CPU running at 1 MHz, and normally shipped with 8 kB of RAM expandable to 32 kB using 8 kB modules. The remaining 32 kB of address space was reserved for ROM, which could be expanded using one or two external ROM cartridges of 8 kB each. It included six character sets in ROM and an extended dialect of BASIC that included various vector drawing commands. The 4051 was released in 1975 for the base price of $5,995 (2016 value $26,900). Adding the optional RS-232 interface allowed it to emulate a Tektronix 4012 terminal. Key designer of the 4051 was Hiro Moriyasu.